In the userpanel at the top left of the InterActor dashboard, there are already a number of shortcuts. They provide one-click access to frequently used interactions. This example illustrates how to add a shortcut to the "LabelsAndCounts" table from the Query with table output example. 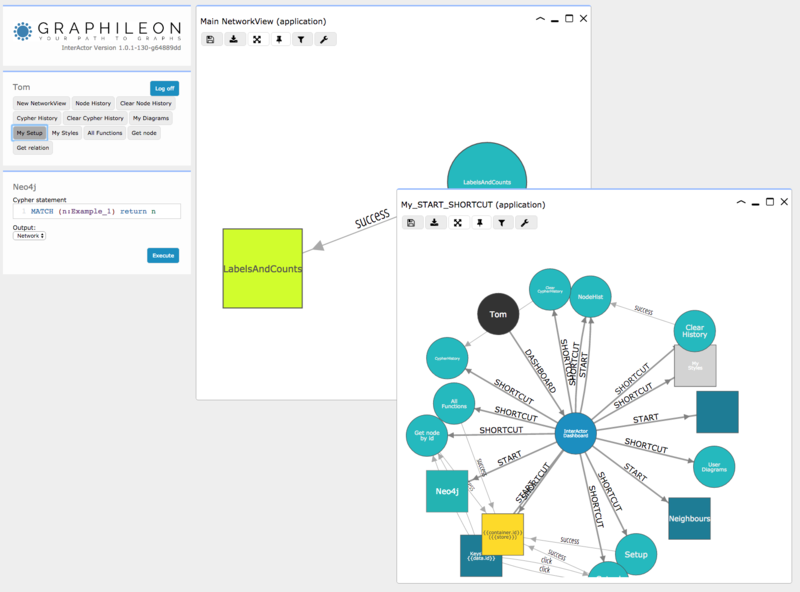 First, verify that your :IA_Function nodes from the Query with table output example are present, by executing the following statement from the Neo4j panel on the left, with Output set to "Network". If nothing shows up, you have probably not run the Query with table output example. Once you see the two nodes of Query with table output example, click on the "My Setup" shortcut. 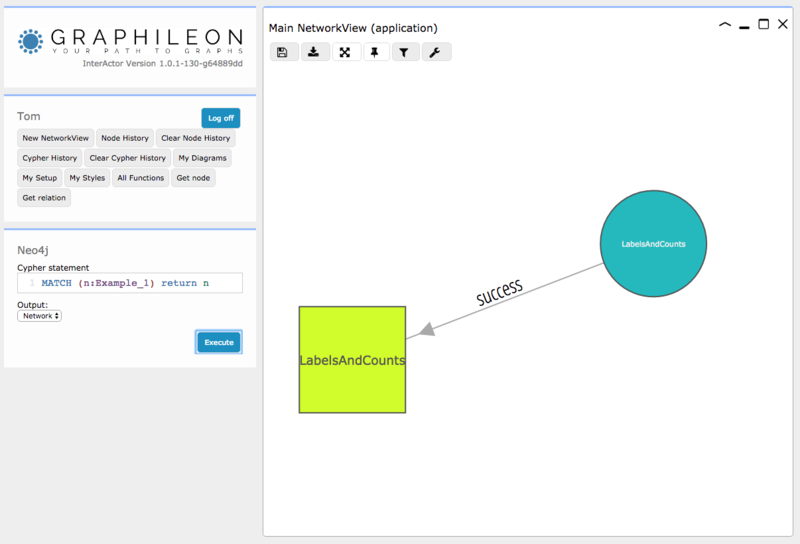 This will return all :START and :SHORTCUT relations in a second NetworkView. Resize the two Networkviews in a way you can easily access them both. Shortcuts are created as relations from a :IA_Dashboard node to :IA_Function nodes. 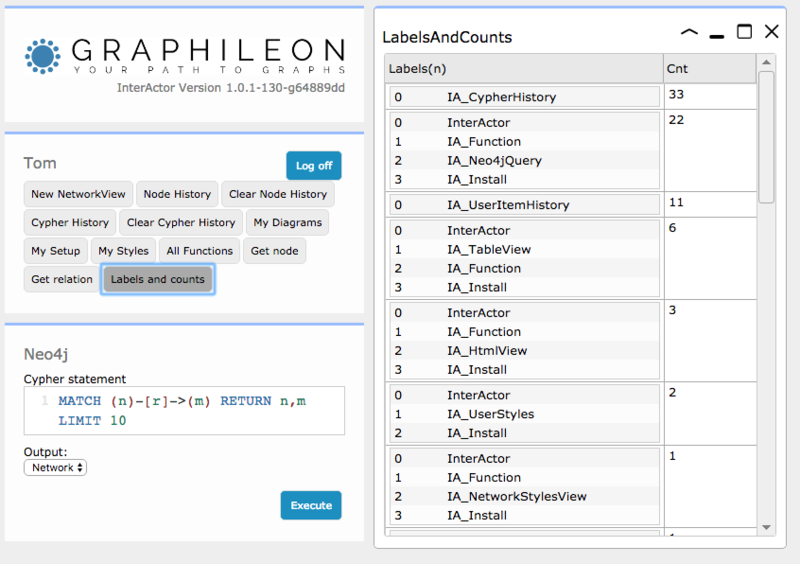 Since we need to create a relation from the "InterActor Dashboard" :IA_Dashboard node to the "LabelsAndCounts" :IA_Neo4jQuery node, we first need to have them in the same NetworkView. 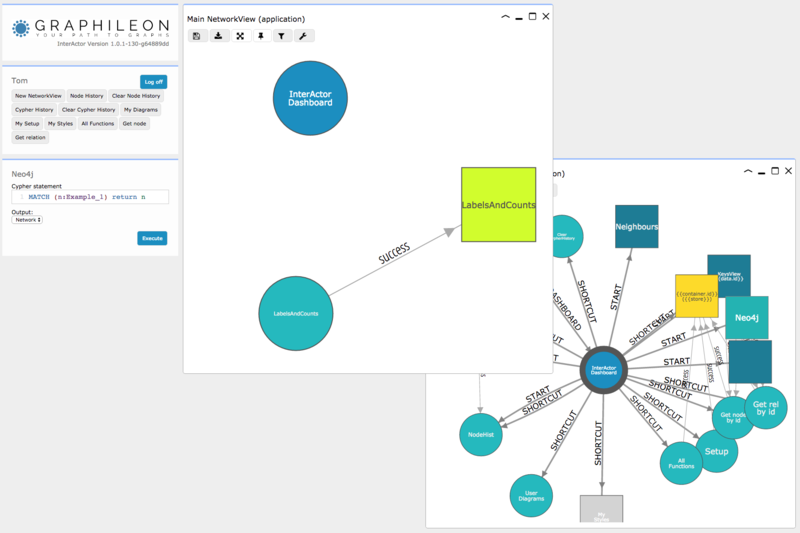 To do so, select the "InterActor Dashboard" :IA_Dashboard node in the NetworkView, switch focus to the other NetworkView and right-click on the canvas. Select "Insert selected nodes" from the context-menu to insert the :IA_Dashboard node. 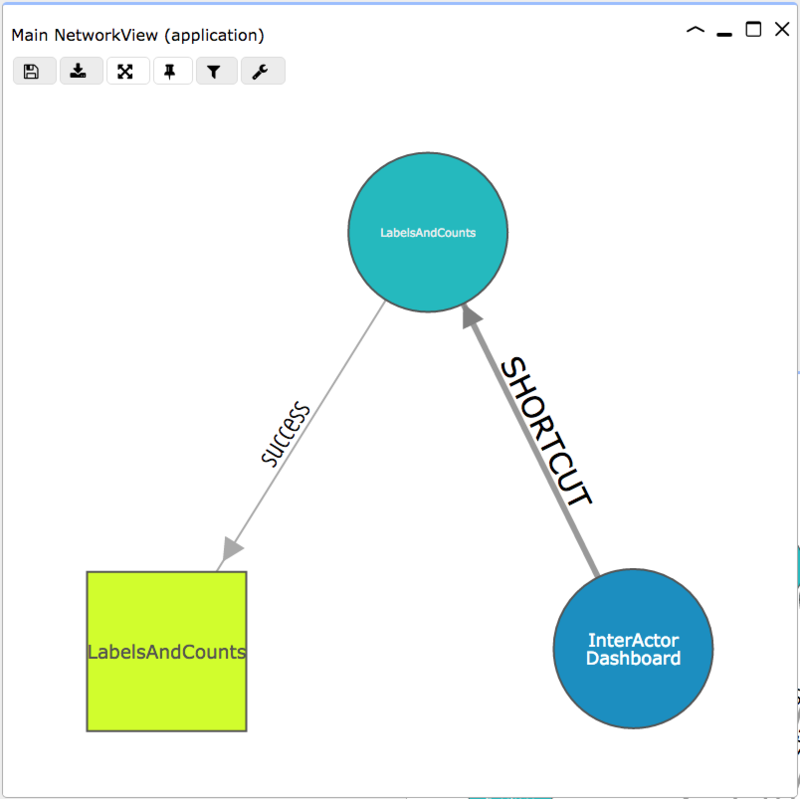 The :IA_Dashboard node should be visible in the NetworkView, besides the two other nodes. But not yet connected. Now create the relation by selecting the :IA_Dashboard node first and then, while pressing <CMD>, the "LabelsAndCounts" :IA_Neo4jQuery node. 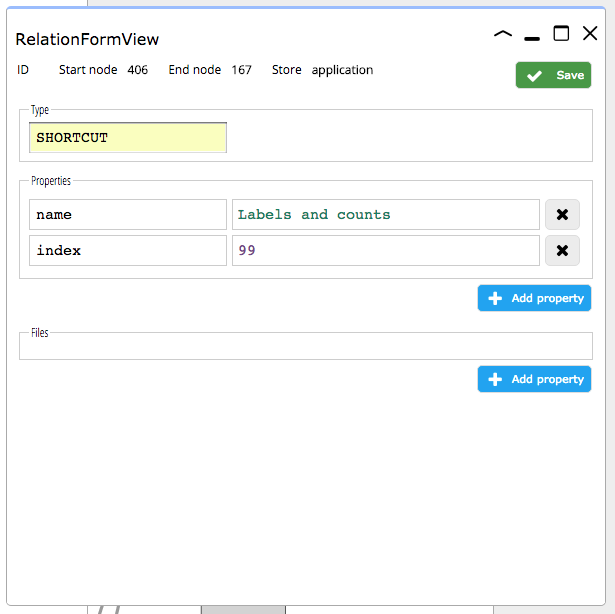 In the RelationFormView that pops up, set Type to "SHORTCUT", add a 'name' property and set it's value to "Labels and counts". In addition, create an 'index' property and set it to 99. 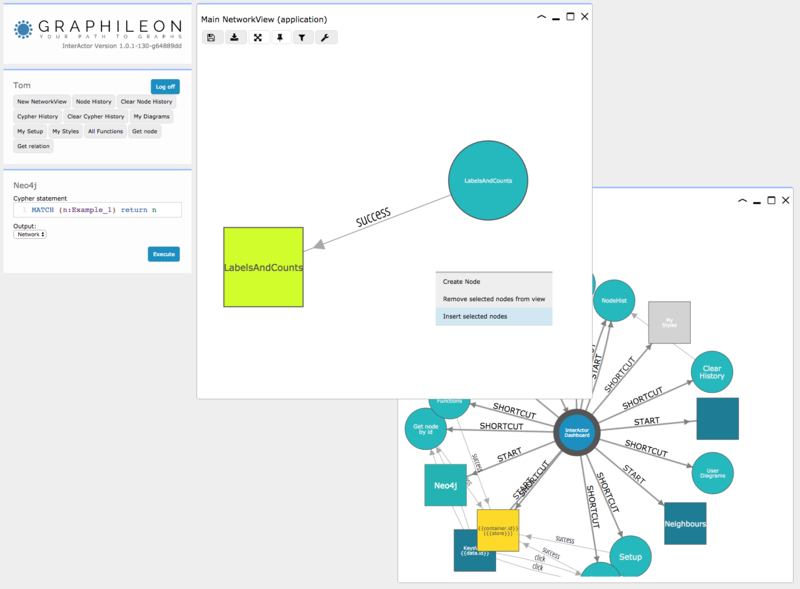 The newly created relation should be visible in the NetworkView. Now, refresh the browser page. The new shortcut shows up nicely. When clicked, you have your "LabelsAndCounts" table.